"It's funny... the world is so different in the daylight. In the dark, your fantasies get so out of hand. But in the daylight everything falls back into place again." After the release of Alfred Hitchcock’s Psycho, the 60s became ripe for more psycho-thriller oriented type of horrors. Films like William Castle’s Homicidal, Peeping Tom, Whatever Happened to Baby Jane?, and Violent Midnight all emulated the Psycho formula and content to an extent. However, there were still low-budget filmmakers determined to deliver supernatural and even gothic horror to audiences of the decade. George Romero was one, giving us the immortal classic, Night of the Living Dead, and one-hit-wonder Herk Harvey was another, giving horror fandom a truly inspired, original classic for all times…Carnival of Souls. A young woman (Mary) joyriding with a friend decides to race another car down a rickety wooden bridge (never a good decision, especially in a horror film). Veering to the side, her car crashes into the river below. Being the sole survivor of the accident, Mary trudges back to land to attempt to resume her life. For starters, she finds a job as a pipe organist at a nearby church and rents an apartment. She meets a nice, but alcoholic fellow who desperately wants to take her out. All the while, she sees visions of a mysterious white-faced and white-haired man. He appears to her at the oddest of moments, while driving, while playing the organ, and elsewhere. She’s also strangely drawn to an old abandoned carnival area. What is the meaning of the white-faced ghoul and what are his intentions with Mary? This is a fantastic horror film. For such a cheapie, no-budget effort, it is surprisingly effective, due to the mood and atmosphere created by first-time feature director Herk Harvey. The film’s main boogeyman, (simply known as “The Man”) is a truly haunting figure and was portrayed by Harvey himself. To achieve such a creepy character, Harvey employs nothing more than white makeup on his face, black makeup around his eyes, and powder in his hair. That’s it. Yet, it’s the facial expressions and the places where The Man appears that provide the scares. In an era of computer generated effects and complicated latex appliances being responsible for creating fear (and mostly failing), it’s hard to fathom that such a simple idea as wearing plain makeup could be made to be scary, but it’s true. This is an effective film. This is the kind of horror film that was made to watch at night. Unlike a lot of 60s fare, I think that you could probably show this one to non-horror fan friends and they would likely be very impressed and entertained. With so much unexplained bizarreness, the film has the feeling of a feature-length episode of The Twilight Zone. Some even say it may have been inspired by an episode of the series entitled “The Hitch-Hiker.” Knowing that only a few weeks were spent on production, it’s really hard to say how much of the film is simply just a “happy accident”. The film is so effective on such a tiny budget, that you often can’t believe that everything worked out skillfully as was intended. Regardless of how planned out and well-crafted everything may or may not have been, it works. The film is nightmarish. Nearly everywhere Mary goes, the ghoulish man follows her. Never being threatening, but simply there. Watching. Perhaps, waiting. The film feeds on mystery, paranoia, fear, and many other appropriate horror emotions. Some of the most Twilight Zone-esque moments occur when sometimes, Mary will be somewhere and suddenly, no volume is heard. She’ll try to speak to someone, but they will ignore her completely as if she isn’t there. Another bizarre touch is the clerk at a clothing store that Mary visits. I've never found anything to confirm this, but I'm sure that the clerk was portrayed by a man dressed as a woman. Her facial features are strongly male and her very feminine voice seems very much like it was dubbed. The meaning of this character in the grand scheme of things, one can only speculate. 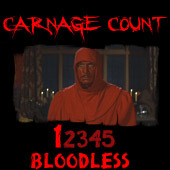 There isn’t any blood or gore, nor is there a body count in the film. The horror of Carnival of Souls is of the cerebral type. A very eerie score made up mostly of organ music helps to build the spooky atmosphere. Of course, the location of the carnival itself also lends a hand in creating the mood. Harvey reportedly happened upon the location one day, and decided it was the perfect location for a horror movie. As it turns out, he was right. The desolate place provides a grim, decayed contrast to what was likely once a very happening, joyous place. Now, it’s only filled with stale memories and sadness of joys that will never be known again. It’s the ideal place that one would think would be haunted. Of course, the central question of the film, is Mary and the carnival actually haunted or is she being followed by sinister beings of another sort? You’ll of course have to watch to find out. The acting is amateurish (utilizing local talent to the Kansas area which it was shot in), but it serves the film okay. None of it is bad enough to be distracting, but of course, there weren’t any Oscar nominees from the bunch, either. Harvey himself provides the best performance, but has no lines of dialogue. His portrayal of the mysterious "Man" definitely ranks up there among the all-time best horror film boogeymen. During an era when horror was going toward a more psychological edge, Harvey here delivers a film that while definitely having a highly psychological slant, is just as much a product of the supernatural. Ever had a nightmare that you're being chased or followed by someone that just won't go away? That's what this film reminded me of. You get the impression that the Mary character is hiding something, but what she's hiding is never completely made clear. The ending of the film is a surprise that I won't spoil, but I will say that it leaves just as many questions unanswered as it answers. It'll definitely leave you thinking long after the credits end. To me, this is a good thing. Carnival of Souls is a film every horror fan must experience. Even if you can’t get into older, black and white films (what kind of horror fan are you?) I implore you to give this one a shot. It creates such a bizarre, spooky atmosphere on such a tiny budget, I also consider it required viewing for all blossoming film students out there. Think Romero’s Night of the Living Dead was the essential horror flick of the 60s? Sure, it’s on the list, but right up there along side it and Psycho is this film. A fantastic debut feature, that was unfortunately never followed up by its director. He instead went on to continue directing educational and industrial films. Fans of this feature can only imagine the terrors he could’ve brought us had he stuck around the horror genre. Carnival of Souls is in the public domain, so you can pretty much find it anywhere on DVD. The two most notable releases are by The Criterion Collection and by Legend Films. Legend’s release features both the original black and white as well as a newly colorized version with audio commentary by Mike Nelson of TVs Mystery Science Theater 3000. Criterion’s release features both the theatrical cut as well as Herk Harvey’s director’s cut that runs an additional five minutes. It also has a wealth of extras, including documentaries, featurettes, and an audio commentary. Audio and video serve the film well in both cases far more than any of the public domain releases. If you can find either disc, these are the way to go on this title. Criterion is a bit more expensive, so you may be just as well going with the Legend Films version. If you've never seen this one, you are long overdue to discover it. It is justly one of the best horror films of the 60s and one of the most effective low-budget chillers ever created. By all means, track this one down and cherish its charms. This carnival will remain a frequently revisited attraction in your home for many spooky evenings to come. Essential!